It is a rare honor that we are able to feature Huun-Huur-Tu, the foremost international representative of Tuva's remarkable musical culture on Vocal Planet. 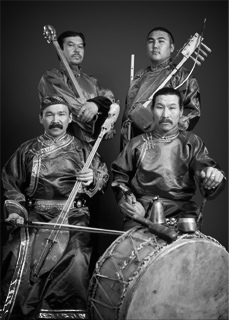 The Tuvans, a South Siberian Turkic people who number some 150,000, preserve what are arguably some of the world's oldest forms of music-making. The best known genre of Tuvan music, xöömei (throat-singing), comprises what one might call a lexicon of musical onomatopoeia in which natural sounds are mimetically transformed into musical representations. Specifically for Vocal Planet, we focused on representing throat-singing, in which a single vocalist simultaneously produces two distinct pitches: a fundamental note and, high above it, a series of articulated harmonics that are sequenced into melodies and manipulated with extreme virtuosity in several canonical styles. Unlike our Western notions of music, Tuvans not only transform the sounds of the natural world into music through imitation; they also make sonic "maps" of physical landscapes which may be expressed in texted songs, throat-singing, whistling, or other types of vocal production. In short, Tuvan music is not abstract, like most Western music, but radically representational, the product of a cult of imitation that ties it to an animistic understanding of the world. Regardless of it's origins and history, everyone who hears it agrees that Tuvan Throat Singing is unlike anything they've ever heard before.